iThoughtsHD was first released in 2010 together with the initial release of iPad. The developer, Craig Scott (UK), focussed on a clean user interface with appropriate functionalities for mind mapping and support for many well-known file formats. Craig talked about ‘Touchy-Feely Mind Mapping‘ on Biggerplate Unplugged, London this year (a conference initiated by Liam Hughes, founder of Biggerplate.com, which brought together mind mappers, software developers and bloggers). 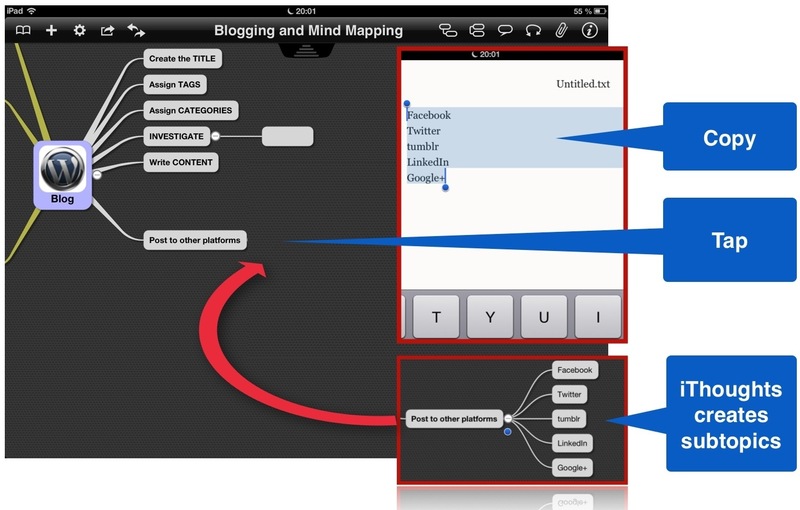 iThoughts is one of the first mind map tools designed solely for mobile and touch-based devices. There is one and only one toolbar at the top of the screen. On the left side there are icons for managing files (locally or on Box, Dropbox or any other cloud with WebDAV support) and for settings. 6 icons are available for the creation process and placed on the right side. The design follows Apple’s iOS Human Interface Guidelines. On my point of view it’s far and away the best mind mapping app for the iPad in Apple’s App Store. If you don’t believe me continue reading. 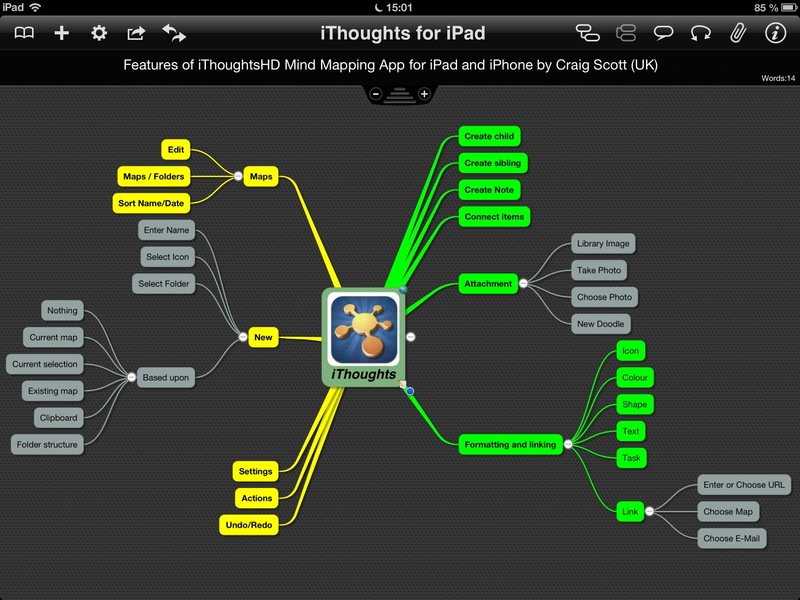 For this post I created a mind map with all features of iThoughts. Let’s start using iThoughts on the iPad. A set of 3 buttons enables you to add child and sibling topics, and to create a topic at the level before the currently selected topic. You can also add a new topic by first selecting a topic, and then double-tapping on a blank part of the workspace next to it. A new topic will automatically be created at that location and a connection to the selected topic is automatically established. This is a very effective and easy way to create topics as you don’t need the toolbar. Use the toolbar to create a child or a sibling by marking the topic it should refer to. The toolbar icons are self-explaing. But it would’t be Craig’s work if there wouldn’t be a simpler, faster and more intuitive way: double-tap near the topic and a new subtopic is created. The shape and color of topics, icons and task details can be set with a multi-tabbed dialog box. One tab is for connecting topics to a website, linking to an E-Mail address or linking to some other mind map alread created. For connecting to websites just tap the topic, select ‘Research’ from the upcoming context menu, search the web and if you found what you were looking for just tap on the task bar to connect the website with the topic. You also may use your choice for creating a new topic, embedding a PDF or open the website in Safari. For inserted links the relating topic gets a small globe at the upper right corner. The link can be opened by first tapping on the globe then tapping on the context menu which contains the web address. All topics with or without attachments can be resized by dragging the pointer of the selected item (Craig calls it the ‘Pointy finger’ for me its the ‘Magical finger’). Each topic can be connected with a photo from iPads camera roll or the photo stream, an image from the built-in library or a free-style drawing (doodle). Select a topic, tap on the NOTES icon, write your note and it will be automatically connected to the selected topic. Craig implemented a keyboard layout which many users of Apple’s iWork suite still miss. Craig implemented an awesome feature when using the Copy-Paste functionality. If you select a topic which has subtopics, use the copy function from the upcoming context sensitive menu and paste the clipboard contents into the body of a writing tool the topic ist inserted with the subtopics neatly indented below. This works the other way around, too: You can select several lines of text in an E-Mail, copy them and paste them into iThoughtsHD. Each line is added as a new topic. Another 5 star rating for Craig. At the time mind map developers are not able or willing to share a standardized file format. Is it for keeping the customers? Anyway it hampers collaboration. But don’t worry. Craig takes care of your requirements. as well as PDF, PNG and CSV and, with the latest version of January, DOCX (Microsoft Word/Apple Pages) and PPTX (Microsoft Powerpoint/Apple Keynote). Migrate to iThoughts and you are back on track. I hope my blogs about mind mapping inspired you to go into the details of this technique. Further articles will be published on Feb 13 and 20. If you want to immediately start mind mapping install this interactive eWorkshop from Hans Buskens, NL on your iOS device. Please subscribe and recommend iNotes4You to your friends.